It’s the same old symptoms every year … cough, congestion, sniffling, sneezing, fever. They’re the hallmarks of cold and flu season, and they return to test our mettle every fall. While our bodies are pretty amazing at fending off most germ invaders, human immune defenses aren’t infallible; bacteria and viruses are in the air and on the surfaces we touch, so it’s impossible to avoid infection completely. Still, a little proactive advice can go a long way toward keeping germs at bay—and managing symptoms when we do get sick. According to Fernandez, the jury is still out on taking extra vitamin C as a way of preventing illness. “Factual evidence is lacking in terms of its effects, but using it won’t hurt you,” she notes. “Vitamins and nutrients are always a good idea, and I like to see people taking ownership of their health. I recommend getting your nutrition from food first. Eat grapefruit at breakfast, and try colorful, antioxidantrich vegetables as well.” She says leafy greens, sweet potatoes and red peppers are good choices. So what if you’ve tried your best to stay well, but germs end up winning out? Decongestants, Tylenol, ibuprofen, cough syrups and other over-the-counter drugs can help, but licensed acupuncturist and alternative medicine practitioner Afua Bromley also has some plant-based advice for dealing with cold and flu symptoms. For chest and upper respiratory infections, she recommends homemade herbal tea infusions. “They can help loosen phlegm and make breathing easier,“ Bromley says. “Put a tablespoon of thyme or oregano leaves in a tea ball and steep it in hot water for three to five minutes.” Echinacea is another beneficial herb that can be taken as a tea or in a capsule, and slippery elm extract is available as a tea or lozenge to coat the throat and calm a dry cough. Bromley says pears can help soothe a raw throat, too. “I tell people to slice and eat them for a day or so when they feel the soreness coming on,” she notes. “Any variety of pear is helpful.” She also recommends kiwi fruit for vitamin C; a Chinese herbal formula called yin chiao; and hot soup with ingredients like carrots, garlic, celery, sweet potato and bone broth. Loose, unpackaged shiitake, portobello and oyster mushrooms also contain helpful nutrients like vitamin D, she notes. Dr. Matt Smith, owner of Thrive for Life Chiropractic, says some nutraceutical supplements contain herbal ingredients that may help support the immune system in times of cold and flu. “Echinacea can help activate white blood cell production and block viral receptor sites on cells,” he says. “Astragalus root extract and elderberry also can help the body’s immune response.” He adds that it’s important to seek advice from your health care provider before taking any supplements. Smith says long-term mental stress plays a role in immunity, too. “Short-term stress is protective of the body because it increases the immune response, but prolonged stress has the opposite effect,” he notes. “In the long term, blood cells that fight off infection tend to decrease.” Exercise, plenty of sleep, meditation, and the services of a chiropractor, functional medicine specialist, massage therapist or acupuncturist can be beneficial, he says. >> Get a flu shot. Each year, the vaccine is tailored to combat strains of flu virus expected to affect your region. It’s your best first line of defense. >> Don’t touch your face. Rubbing your eyes or putting your fingers in your mouth gives germs an entryway into your body. >> Get enough rest. Everyone is different, but sleeping 7 to 8 hours a night is considered best. >> Exercise regularly. Healthy physical activity can boost your immunity, too. >> Keep your hands clean. Wash them thoroughly with soap and water, especially after touching common surfaces like doorknobs, and keep hand sanitizer nearby. >> Keep surfaces clean. Use disinfectant wipes on countertops, gym equipment, airline tray tables and other common areas. It’s just as important to reduce the risk of passing flu germs to others! 1 Again, keep those hands clean. Stash small bottles of hand sanitizer in your car, office and handbag. 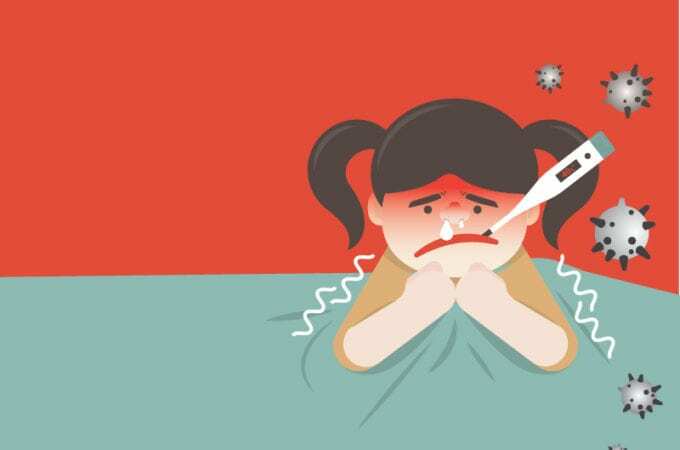 2 Cover your nose and mouth when you sneeze or cough. Experts recommend covering up with a tissue or tucking your face into your arm to minimize the spray of germs. 3 Stay home if you feel sick. Once your temperature has been normal for 24 hours without fever-reducing medicine, it’s likely OK to return to work or school. 4 Go solo. It’s a good idea to minimize the spread of germs by limiting contact with others. 5 See your doctor to prevent further problems. Flu can lead to complications like pneumonia and sepsis, which are no laughing matter for you or those around you.